A safe and reliable vehicle. The Hyundai Tucson is a great car for the whole family. It is a safe and reliable vehicle that I trust to get me to my destination. It is very comfortable and roomy both as driver and passenger. It has roomy back seats that give enough room, so that your not sitting on top of each other and also have enough leg rooms. The backseat is roomy and comfortable and would be good for passengers whether adults, children, or teens. It is good for long trip due to it being reliable and comfortable. This car can easily go the distance. Mine has traveled from Pennsylvania to Tennessee and back safely and comfortably. The cargo space is sufficient for both short grocery trips or longer road trips. The back seat folds down to allow for more cargo room if needed. This car handles well in all road conditions. It has gotten me safely through massive snow storms, torrential downpours, hailstorms, road construction, and everything in between. It has handle well on highways, dirt roads, backroads, and every other type of roadway. I have never gotten stuck no matter the road or weather condition. The car sits high enough it can travel safely through water, snow, or on less than ideal roads without damaging the underneath. The safety features available make this an ideal care for families or single ladies. I have automatic locks with a key fob. The key fob has a panic button and a feature which only opens the driver door so no one can jump in the passenger side unless you want them to. 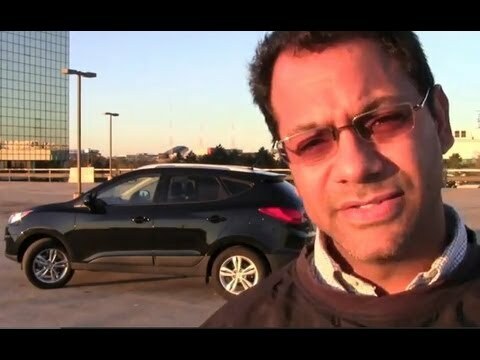 Overall the Hyundai Tucson is a safe and reliable vehicle that I would highly recommend. Smooth riding in the Tucson with smooth jams. Vehicle is reliable and a smooth driving car. There is a ton of room inside to work with and to store stuff into it specially when traveling. Love the Bluetooth feature and I use that more than anything when it comes to listening to music and podcast on my phone. I do not use the XM feature and am annoyed that it is a feature that does not go away. The speakers are okay and for some reason the volume is lower when I am using music off my phone. The gas mileage is decent. Smooth riding with Hyundai Tucson. I love my Hyundai Tucson. It has been a very reliable car for me. It has always drove smooth. It also gets very good gas mileage. I would definitely recommend it to someone who is looking for a small SUV. That is exactly what I was looking for in a car when I bought it. I myself, read many good reviews on it before I made the purchase. I have almost had it for five years now. I do not plan to get rid of it anytime soon. Hyundai Motor America (Hyundai) is recalling certain model year 2011 Hyundai Tucson vehicles manufactured July 22, 2010, to October 31, 2010. The affected vehicles have a transmission fluid cooler hose that may have been improperly manufactured, resulting in a transmission fluid leak. Hyundai will notify owners, and dealers will replace the transmission fluid cooler hose, free of charge. The recall is expected to begin March 25, 2016. Owners may contact Hyundai customer service at 1-800-633-5151. Hyundai's number for this recall is 139.